Although it's been announced that Windows 10 Mobile won't be supported anymore and there'll be no updates, it's still too early to say the final good-bye to the system. After all millions of both regular people and business organizations employ Windows 10 Mobile services. 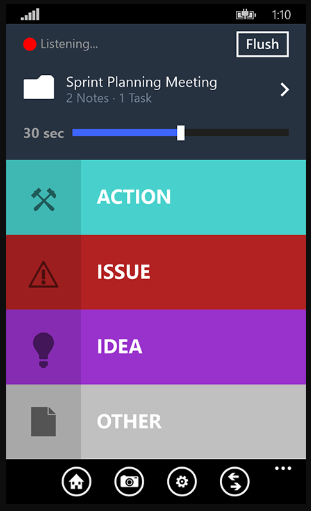 Our Top Ten Free Apps for Windows Phone will help you get more productive with your Winphone. VLC is easily recognizable thanks to its iconic emblem - orange traffic cone. This traffic cone metaphorically commands video bugs and unplayable formats to stop pestering your Winphone. Audio options. Equalizer has a number of popular presets, but it also can be tweaked manually if you need a slight bass boost. Organizing. Music tracks and videos can be organized into albums, libraries, and playlists. Formats. Media-formats supported by VLC is truly astounding: MP4, OGG, MP4, AIFF, MXF, Blu-ray, FLAC, Opus, and many others. Even such exotic formats as Monkey's Audio and Matroska have made it to the list. Subtitles. From Substation Alpha to simple .txt files. VLC Players is one of the best apps for playing audio/video. And it does its stellar work for free. A fabulous business app, CamCard allows you to "transport" information from the business cards - names, phone number, address, etc. - right to the e-card catalogue located on your phone. In other words, it does the same thing as an analog card scanner, only it doesn't cost $134.95 like the one you can find on Amazon. Save it on your cloud storage. Put it in an Excel document. Share it with colleagues etc. As of now CamCard can recognize up to 16 languages, but can stutter if it sees odd and quirky fonts. CamCard is perfect for busy people, who don't have time for saving business card info manually or can't afford a card-scanner at the moment. This application can be described as a calendar on steroids — it has the simplicity of a regular calendar app, but its extra-features make it more advanced. With it, you can schedule anything: from a hiking trip to cordilleras to a study plan for the MCAT examination. CalendarPro Free is compatible with the Windows Live Account, thus your plans and schedules can be sent from one device to another. No matter how busy you are, CalendarPro Free won't let you forget about birthdays, anniversaries, Christmas, Hanukkah and the first day of school. Box may not have all the recognition that Dropbox, OneDrive, MEGA, and others have, but it's a very reliable and user-friendly cloud service, rich in features. It has three types of accounts: free, premium and business. However the free account offers a pretty generous 10GB of cloud space, with a 250MB limitation for every individual file, so you won't be able to keep your Blu-ray movie collection with director's commentaries in Box. At least for free. Moreover, the stuff you're intending to deposit in Box can be accessed from multiple devices thanks to the Box Sync feature. It's a handy way to transmit files from the phone to your computer/tablet etc. Especially if you've lost your flash drive or external HD. The free Box account is indispensable if you need to store a photo album, PowerPoint presentation, digital cookbook, Excel database or a collection of emulated Sega games somewhere safe. As it's clear from the name of the app, Effectual helps you to be productive, focused and efficient every day. At whatever you do. Within those categories you can set due dates, schedule events, organize to-do lists, mark deadlines and track your progress at being a self-disciplined wizkid. 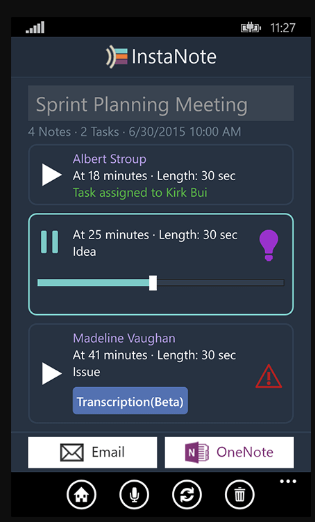 Additionally, Effectual can be synchronized with your PC via Microsoft Azure, so you can edit/add new tasks to your PC from your Winphone and vice versa. The app works offline as well. 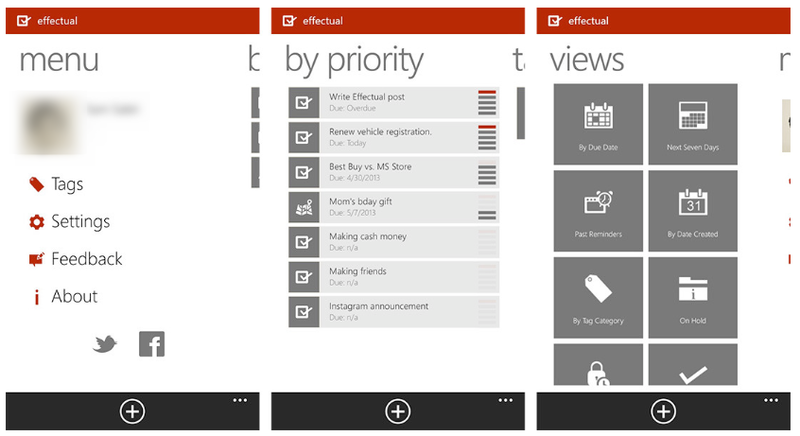 Effectual is a marvelous to-do app for Windows Mobile: no more being late or breaking deadlines. Odds are you've dealt with it before: a brilliant idea, smart thought or an awesome solution sparks in your head like a light bulb and then disappears leaving your brain in darkness again. To prevent this from happening, you should install InstaNote: a free app for making voice memos, reminders, instructions, etc. Moreover, it's pretty good for audiotaping lectures, business meetings, seminars and so on. As long as you have enough memory on your Winphone. As soon as you're done with recording, the audio material can be separated into smaller audio clips (starting with 30 seconds). It makes analyzing, transcribing, studying and highlighting important moments from the taped event much easier and faster. InstaNote is way better than a pencil and a pad: no genius idea or important note will slip away from your memory. iTel Mobile Dialer specializes in providing users with VoIP calls and free, nearly unlimited cross-platform instant messages through 3G, 4G and Wi-Fi. Calls have a good audio quality. It seamlessly unifies communication tools on your Winphone. Allows you to avoid polluting your personal WhatsApp, Viber, Telegram, etc. with business/work contacts. iTel Mobile Dialer is a communication app of choice among professionals. Enter the IP address of your computer (you can learn it through “ipconfig” command). Type in the credentials for identification. Furthermore, you can do video/audio streaming via the app; open, read, edit text files and so forth. Thanks to Microsoft Remote Desktop, you will have access to your PC on the go. If you're a college student, school teacher, office manager, business person, etc. And doing a lot of paperwork and making documentation copies for personal needs is your regular routine, then Microsoft Office Lens is a must-have. Books. You won't have to overpay for photocopying a rare book now, because the app will basically do the same. Documentation. Whatever you need to preserve: cashier's check, flight tickets, certificates, medical prescriptions, notes, etc. Business cards. The app works almost as fine as CamCard, only it fails to decipher entangled fonts. Whiteboards. College math or chemistry students will appreciate this feature a lot. Add the scans to your OneNote account. Email the info to your co-workers/classmates/yourself etc. Convert the info to PDF, WORD or PowerPoint formats. Keep it stored on your device/SD-card/cloud storage. Microsoft Office Lens is a real blast among the free Windows Phone apps. It provides so many useful functions, for which other applications aren't shy to charge money. All the language barriers will be crushed with the help from this application. Designed by a Microsoft's own team, Translator employs the same technologies and algorithms, which dictate the work of Bing search engine. At the moment Translator can recognize, analyze and interpret the written text in 51 languages. As for understanding spoken info, Translators repertoire is limited to just 18 languages at the current moment. Probably their number will be expanded later. And even a Klingon dictionary has been added. What is really remarkable about the app, is that it can understand road signs, instruction signs at the airport, restaurant menus etc. Even whole magazine/newspaper articles can be translated almost instantly. As an extra bonus, it works charmingly offline too. Microsoft's Translator will be your loyal and extremely intelligent companion whenever you travel abroad. Simplified version of the fabulous Adobe Photoshop will let you do the real magic with your photographs. Whether you want to process your latest selfie photo-session before uploading it to Instagram or making pictures at sunset is your favorite hobby, and you want them to look stunning - this app will make your art sparkle. Editing, cropping, red-eye erasing, color balancing, visual noise reduction and a variety of filters - only your fantasy and patience will be the limit of your creative process. Besides the app is very easy to use: every option requires one-two taps. Photoshop Express can do miracles with your photos.